The hotel has 41 rooms, 33 of them are twin beds, 5 are double beds and 3 of them are family rooms (with 3 beds). The inevitable Greek blue and white colour scheme gives a cool fresh look. The bedrooms are simply furnished typical greek rooms, all incorporating an en suite shower, washbasin and WC, plus a private balcony. Two of them have a small hip bath. All rooms include air-condition. Generally the rooms overlooking the pool are considered to have the best view, so book early for these! 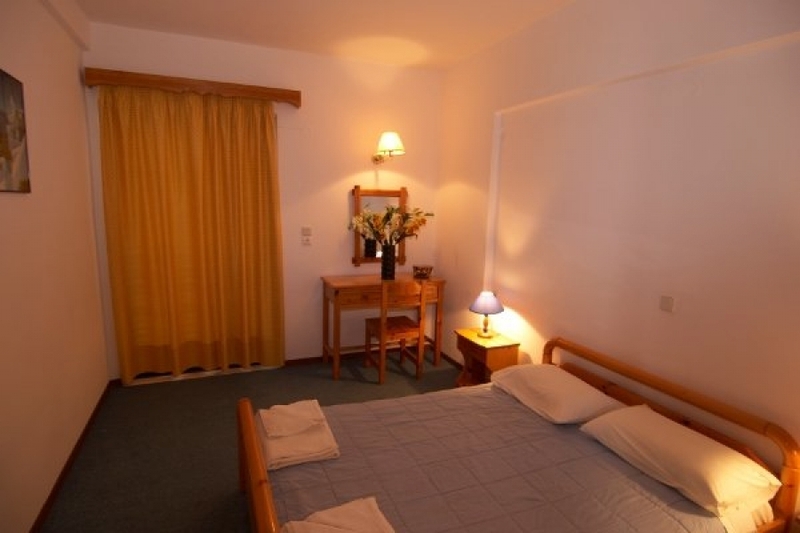 The triple rooms on the ground floor are larger and have space for a fourth bed. As there is also space for up to two children to share with their parents in these rooms. Our Hotel is also surrounded by beautiful gardens with al lot of trees and flowers!